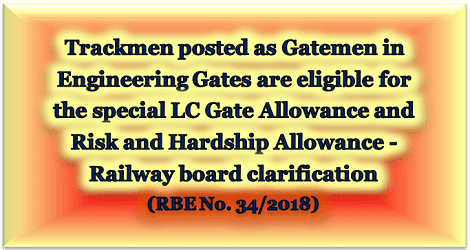 Sub: Grant of Risk and Hardship Allowance and Special LC Gate allowance to Track Maintainers posted as Gatemen— clarification reg. Please refer to Board’s letters No.PC-VII/2017/I/7/5/4 dated 10.08.2017 (RBE No. 87/2017, PC-VII No.33) and No.E(P&A)I-2017/SP-1/CE-1 dated 30.08.2017 (RBE No.110/2017, PC-VII No.48) regarding grant of Risk and Hardship Allowance @ 2700/- per month for Track Maintainers and Special Level Crossing (LC) Gate Allowance @ 1000/-per month to Track Maintainers deployed for manning any of the Engineering gates respectively.